How about an extra Christmas present for your cat? 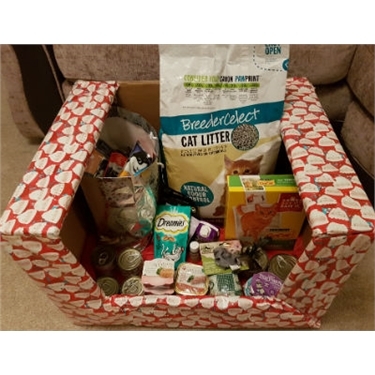 The hamper contains food,toys,biscuits,cat treats and a large bag of litter. Tickets cost £1 each; £5 for a strip of 5, or £10 for a strip of 15 tickets. The raffle will be drawn on 16th December in time for Christmas. We can deliver in certain parts of Hertfordshire. Email Carly at carly.bradbury@cats.org.uk or tel:07968470323. Or through our Facebook Cats ProtectionThree Rivers&Watford.